Pattern Mixing, in both novice and advanced forms is so very on trend. If you’re battling with the bold concept, but would like to give it a try, here are four patterns that are relatively easy to mix and match with other patterns, namely a stripe, a polka dot, a plaid and an animal print. In these visuals, the floral skirt is the dominant pattern, while the others are the supporting patterns. If you keep the supporting patterns two-toned and within the same colour palette as the dominant pattern, they’ll be easier to mix together. Of course, keeping both patterns in the same colour palette is just one way to mix patterns. Here’s an example of a supporting pattern, the green plaid, that’s still two-toned, but it’s not in the same colour palette as the dominant floral. In my book, this is a more advanced, fashion-forward form of pattern mixing, that totally works. Although it might not be your cup of tea. Personally, I don’t do a lot of pattern mixing because the effect is maximal and my style is about a more minimal look. That being said, in the name of trendy fashion fun, I thorougly enjoy wearing subtle forms of pattern mixing, like the outfit I wore on New Year’s Day, and will even throw in the odd maximal look from time to time. Pattern mixing is not something I do very often: I guess it is too maximalist for my style. It is fine when one pattern is very subtle like your glen plaid trousers: it reads almost like a solid color so that would work for me. I also have done different patterns in the same color scheme and liked how it turned out. The problem is I do not have that many patterned items in my wardrobe to experiment with – for some reason I find it hard to buy. Thanks Angie! I might try a mixing! Love the second! Great idea, thanks Angie! I esp like the dots and animal print. In fact, it almost makes the animal print look like a neutral! I’m going to give this a whirl. I think I could pull off tonal pattern mixing much better than contrasting colors…. I do much better when I aim for less color contrast in my outfits. I’ve always thought it had more to do with coloring, body shape, etc than just if one aspires to be less or more fashion forward… would you agree? Am I making sense? Thanks, Angie! I can totally see how the first 3 work wonderfully together, even though this is far more *maximal* than my style at the moment. I am going to keep my eyes open in my closet for things I can try! I really like pattern mixing with stripes. I think they are easy to mix in and almost act like a solid since the pattern is regular. I find it easier to pattern mix when one pattern has a very small design on it. When both patterns are large, this is too overwhelming for my eye. I like the more subtle combos, but I think there’s a line where “pattern mixing” crosses into “I just pulled two totally random non-matching items out of my wardrobe and put them on” and that last combo is definitely on the other side of that line — for me at least. I think the most important thing in pattern mixing for me is scale. Small subtle pattern with big pattern seems to work OK for me. Okay, this is my POT of tea! Love to mix patterns and fabrics and this is where I truly feel that my style can be original and make a statement. To my eye, mixing patterns “takes it down a notch” and the look is warm, not too thought out and endearing. I’m off to my office today (only go in 3-4 times a month, heavenly!) so am wearing……. I love mixing polka dots with plaid and for spring/summer am on the lookout for dotted swiss……this is such a fun trend…thank you for photos and tips! I didn’t like the last example (with the green and white blouse) immediately, but I actually think it would look really great with some kind of accessory to tie the two patterns together – or maybe green shoes to repeat the blouse colour. Thanks Angie, this is terrific help. I love polka dots and florals, and you’ve shown a great strip-plus-florals too! Queen Mum, combining low colour contrasting patterns is definitely easier on the eyes. I would describe that type of pattern mixing as “safe”. Not sure what you mean by the second part of your comment though. Please chime in again because I would like to understand! Lisa, completely right. The combination is far less overwhelming when one of the patterns is extremely subtle and small in scale. Cynthia, many years ago, I would have agreed with you. I think that fashion has moved on somewhat – the same way that wearing navy and black is stylish, but 15 years ago it would have been considered bad style. The more I see crazy pattern mixed combinations, the more I have come to appreciate them. But then I also get that the more hectic combinations are not your cup of tea. Glam on the inside, that’s a great point. Add a white handbag and red shoes to that last combination with the green plaid, and the patterns will look more pulled together. I am saving these tips, because it’s good to have the basics of pattern mixing at hand when you need them. Even though I prefer a more minimalist look for myself, I really love all of these ideas, and you just reminded me of a bold stripe with stripe mix that I would love to try (maybe not exactly minimalist either, but I loved it anyway). I love how you are featuring pattern mixing, Angie! It feels so fresh and fun to me right now. I guess I’m a minimalist at heart or a novice at pattern mixing, because at first I thought, “what’s going on” with the advanced example using the green shirt. Yet, when you and glam on the inside mentioned adding items to pull the fashion-forward, it did seem to work in my head. But, I don’t think I would wear something like that, because I’m not a big or small print fan, in general, and I don’t have a lot of prints in my closet. I might be willing to give the novice, more subtle forms, using the same color palette, a try, just for fun. …and just the other day I have thought how much of a solid color + solid color person I am. But, looking at these examples, especially the ones with stripes and polkadots, I see some room for experimenting. This desire could be down to feeling very comfortable with where I am at the moment style-wise and being ‘brave’ to branch out a bit. I love this! I love the green gingham with the skirt! This is what I need, some boldness in my outfits. is that some people tend to be able to wear ALGO without their outfit overpowering themselves… the difference between wearing an outfit and an outfit wearing you. For example, Nicoleb wears alot of contrast and some pretty significant silhouettes but she never looks like she’s trying too hard or that her outfit is clashing or competing with her lovely self. Jonesy as well. I guarantee if I tried to copy some of their outfits, the outfit would enter the room 3 steps ahead of me! To me, it’s not necessarily a matter of my eyes adjusting, but more a matter of harmony and cohesiveness. IMO, some people can do ALGO and still look cohesive and harmonious, others, not so much. Am I alone in my thoughts? I love these examples of pattern mixing! I love color, texture and pattern, so these all look great to me, although I have a harder time with the last one. I like it with the accessories you mentioned, though, I can picture it then. I’m working on getting more colorful clothes, because I think I’m happier with more color (and pattern). I agree with those who would like this better if the stripes/polka dots were smaller than the examples. I have really been getting into lower-key pattern mixing, though. It’s like salt for your outfit! I find it less out-there if one of the patterns is rather low-contrast in terms of color. Like right now I’m wearing a black and white dress (sort of s scribbly checked pattern) over a skirt with a gray-on-black pattern, which shows a bit at the hem. Also (does this count as pattern mixing?) if one of the items has a uniform all-over pattern but the other has a specific print or design. Thanks, Angie! I LOVE pattern mixing! I generally keep it subtle and simple, but I think it’s so fun all the same. This is brilliant – love the visual aid. I pattern-mix occasionally, but not on a huge scale. Would love to experiment more, and these are great ideas. 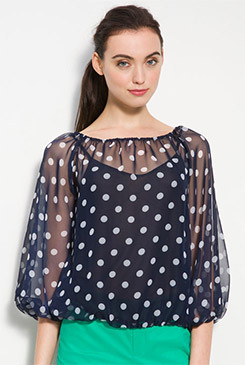 I love the polka dot with the floral pattern, it looks natural to me while still bold. Also digging the animal print and the stripes. Not so sure about the plaid and check, but that’s probably because I’m generally not so drawn to these patterns personally – it definitely makes sense stylistically so I’m sure I’d like it on others. Angie, do you own that skirt? It SO looks like an Angie skirt!! I LOVE it. I totally agree that these four patterns are great for mixing… they all function in some ways as a “neutral” or “solid” next to the bold floral pattern. Another thing I like to do is pattern mix with a “monochrome” pattern and a boldly colorful one. (By monochrome I mean something either combining two close shades of the same color, or something like lace that incorporates holes or texture patterns rather than color patterns). I do agree that there is a fine line between “bum” and “trendy” when it comes to pattern mixing (or, as someone once said to me, between “homeless” and “Anthropologie”) and, for me, it’s all about trusting my eye. 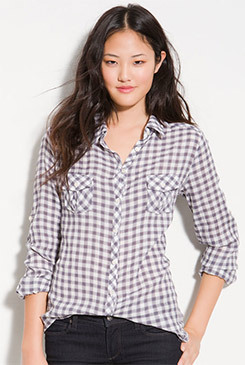 I thought those shirts were gingham checks, not plaids. 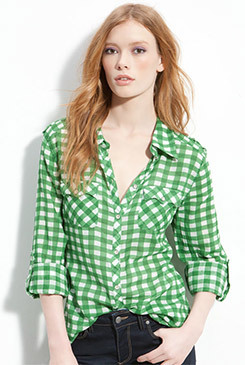 Doesn’t a plaid incorporate several different colors and often irregular horizontal and vertical stripes? And to me, would be much harder to mix with other patterns. Although i have seen multiple scottish plaids worn together and its can look very chic. Queen Mum, I totally get what you’re saying. One stylist I’ve followed advises to choose prints and color schemes that have about the same level of contrast as you find in your own face, taking in the overall picture of your face framed by your hair. So someone with very dark hair, very light porcelain-like skin, and bright eyes would be high contrast and so high-contrast prints and color combinations would look harmonious on her. I’m pretty medium contrast, especially with my hair graying. 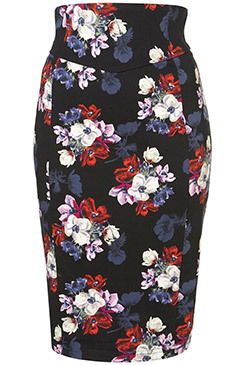 I feel a little overwhelmed by high-contrast prints and don’t see myself wearing a pattern like the one on the skirt. I might wear those colors, but I’d prefer the pattern if it were more blurred and impressionistic. I appreciate the tips tremendously, Angie, because I can apply them to the prints in my own closet. I love this little tutorial for giving me a starting point with pattern-matching! Teri, plaid used to mean something very specific (like tartan), but these days people use it for almost any checked pattern, and I’m doing that here. Diana, I loved your comment. Jonesy and MaryK, I knew you’d like these examples. Queen Mum, thanks for chiming back in. I think it’s a matter of style preference – you like those looks on Jonesy and Nicole, but not for yourself. If you *really* wanted to pull off the same types of pattern mixing looks – you could! I don’t think that the outfit would be wearing you with the right level of reassurance and confidence. Linda, I think you are mixing a panel print with an all over print. Sure, that counts as pattern mixing! I also like your “salt” analogy. Pattern mixing can give an outfit more flavour. Great combinations, Angie! Thank you for this mini-guide! I am attracted to the first same-shade mixes, but the last combo is just too different/mismatched for me. It reminds me of the outfits I used to see on many middle-aged Japanese women when I lived and worked in Japan in the ’80s. I thought they must all have been getting dressed in the dark, their clothes were so randomly and (what seemed to me) horribly mismatched. But perhaps the pattern mixing trend was in full bloom there and I was just stylistically unaware! I think I accidentally pattern mixed today: black/gray stripes and black/white crosshatch… or is that more of a texture, and not a pattern? That oh-so-beautiful skirt would look good with anything! Ooohhh, I luv all of these and I would have never thought to mix animal print and florals. I’m going to go play in my closet with these guidelines! Thanks Angie! Love all of these examples! Of course, I’m also on the Team that thinks stripes, dots, and checks can be (and should be!) mixed with anything I REALLY love the last example with the green gingham, and super super love the fun twist of the green picking up on greeness in the flowers that isn’t actually present in the pattern (leaves, stems, etc.). So very clever!! I love to pattern mix, though my style is more minimalist; I definitely do it more in the spring and summer. I saw this post first thing in the morning and resolved to wear a fun pattern mix today (gingham+leopard), thanks for the inspiration! My head hurts looking at those combinations. I can’t imagine being able to pull that off. Actually, I can imagine pulling that off. I can imagine putting it on and then pulling it right back off. Hmmm…I am generally not a fan of either prints, florals or patterns, particularly in brights Mix them all together and I almost cringe. This look is soooo far from my style persona that I struggle to look without a critical eye. This is a look I will never aspire to. I like the way Atlantic Pacific pulls this off, but she is one of the very few who do…the rest just look like chaos to me and I am not getting why more is better. More color, more print/more pattern, throw in some neon tights and a colorful bag…enough already!! I think this trend will stay on the fringe…. None of my style icons are embracing this…Caroline Herrera for one…unless I have missed something. The “more is more” look is a style, and very fashion forward at the moment. But it’s totally okay not to like bold pattern mixing, ladies! It’s just not everyone’s cup of tea. I’m still in YLF Kindergarten when it comes to pattern mixing! I love these types of posts, though, and am paying careful attention. Who knows – one of these days you may see me giving it a try! I think these looks are TONS of fun. They aren’t necessarily for me personally, but I would very much enjoy seeing them on others. And I might even enjoy the experiment of trying them out…if I owned any patterned clothing, LOL. Actually, it’s not that extreme, but I do tend to buy solids! Meanwhile, I can’t wait to see the outfits this will inspire on the forum! I love the way the checked shirts work with this skirt. The checks are homey and sweet like the skirt’s flowers, yet the pencil skirt silhouette is va-va so it’s a sophisticated combination. Thanks, Angie! Visual aids are always great. I’m trying to get my finger on why this appeals to me. I think it’s because I can match colors or pick up colors while at the same time introducing a more mismatched element. In other words, I’m a little tired of color matching (or mis-matching) with solids, so pattern mixing looks like a fun try. In fact I’m pretty sure I tried it several years ago, too. Angie, Thank you! This is a tremendous help and will give me confidence to try more advanced pattern mixing than the simple ones I’ve been doing. (Today it was a black and grey snake print top with charcoal pin striped pants). I’ve especially loving the polkadots and the animal print with floral. The last example may be out of my ability range but I can enjoy it on others. I like the look and can admire it when it is done well, which is easier said than done. Not especially compatible with my personal style, but I have seen some fab combos that really tickle my fancy. Thanks for the easy to follow tutorial. I love #2; guess I know w hat to wear tomorrow. Bold pattern mixing like this is just not where I am on my style journey right now. And i think it takes a certain eye to do it well. This is a trend I’ll personally pass on. I really like these explicit examples. I can imagine myself playing with this when I am in the right mood. I was just about ready to do florals and stripes yesterday, but didn’t bite the bullet. I can’t imagine following this trend for me. Seems to fussy. Probably because I don’t wear a lot of pattern to begin with. I do like the strip with the floral but some of the others are not as easy on the eye. I so admire those who pattern match with love and abandon, but I fear it’s just a bridge too far for me at this point in my style journey. I’ll just admire from afar!